Learn how to link your Merchant Service account to your QuickBooks Online company. Sending e-invoices and letting your customers pay online make it easier for you to do business. To turn on this feature in QuickBooks Online, link your Merchant account to your QuickBooks Online company. We'll show you how. 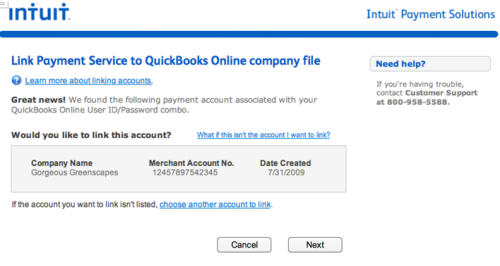 Is your Merchant account currently linked to a QuickBooks Desktop company? If your Merchant account is currently linked to a QuickBooks Desktop company file, there are a few things you'll need to do first. Make sure you can log in to both your QuickBooks Desktop and QuickBooks Online company file as a Master Administrator. Check if you'll be able to access the email account used when the Merchant account was set up. From the Customers menu, select CC Processing Activities, then Automatic Credit Billing. Select Suspend for each recurring charge. Set up the recurring charges in QuickBooks Online after your Merchant account is linked. If you have recurring transactions that run directly from the Merchant Service Center instead of QuickBooks Desktop, contact Merchant Account Services at 1-800-558-9558 to discontinue these recurring transactions. Now, link your Merchant account to QuickBooks Online. Sign in to your QuickBooks Online account. Select the Gear icon, then Account and Settings (or Company Settings). You'll see this screen, once it detects the Payments account. When the account has been successfully linked, you'll receive a confirmation page. To confirm the account is linked go to Account and Settings (Company Settings), then Payments. You should see a Manage details button. 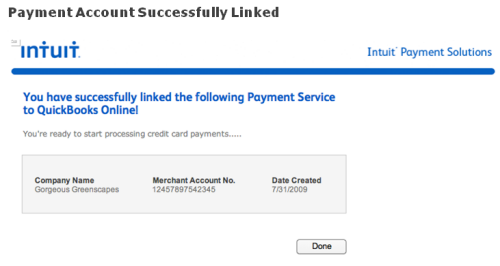 This means your QuickBooks Payments account is now successfully linked to QuickBooks Online. Depending on the specific type of merchant account you have, you may not be able to link it from the website. In that case, you'll need to call Payment Services support at 800-558-9558 to complete the process. You can also contact them if you want to unlink the currently linked account and link another.